Nitrogen emissions are an important environmental concern by both State and Federal regulatory agencies. Nitrous oxide as a greenhouse gas has a greater potential to warm the atmosphere than CO2. Previous studies indicate Nitrous oxide accounts for 47.8% of total agricultural greenhouse gas emissions. Nitrogen fertilizers are estimated to be the major source of nitrous oxide production in agriculture (http://www.epa.gov/climatechange). In addition, the number of wells in California that exceed health limits for nitrate continues to rise. Accurate assessments of nitrogen movement through agricultural systems are a critical need. 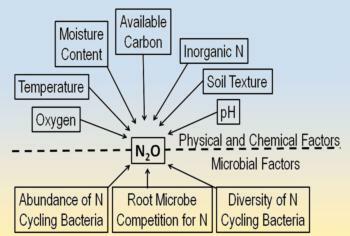 However, the production of nitrous oxide in agricultural systems is complex (Fig.1). Reducing these emissions will be challenging. A central goal of the overall project tis to determine and improve nitrogen use efficiency in nut tree crops. Integral to this goal is the effort to minimize movement of gaseous and reactive forms of nitrogen into the atmosphere. Our work involves measuring nitrous oxide emissions to develop a spatial model for these emissions associated with fertigation. Nitrous oxide budgets in agriculture are summaries of the major inputs and outputs of this gas in a cropping system. 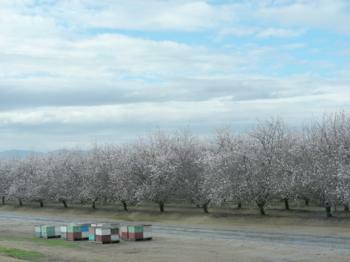 We hope to develop accurate nitrous oxide budgets in California almond orchards. in addition to nitrous oxide (N2O), our study also includes nitrogen in the form of NH4+, NO2- and NO3- and the gaseous forms of NH3 and NOx. Almonds are a nitrogen intensive crop. In commercial orchards, fertigation systems provide each tree with multiple drip emitters, or employ microjet sprinklers. It is important to establish spatial patterns of N2O emissions in orchards, and to assess whether the total N2O emissions in an orchard are influenced by the microirrigation system used (i.e., microjet sprinkler versus drip). Orchard Sampling site at bloom. Kern Co. The overarching objective of this project is to assemble event related emissions of nitrous oxide (eg. during irrigation, fertigation and precipitation) and assemble annual budgets for various management scenarios (eg. with conventional drip irrigation versus stationary fanjet sprinkler, and with different fertilizer types, amounts and frequency of delivery). Comparing N2O emissions from two different forms of nitrogen (N) fertilizers, urea ammonium nitrate (UAN) versus calcium ammonium nitrate (CAN). Development of spatiotemporal models of N2O emissions variability with respect to fertigation using conventional drip fertigation versus stationary fanjet sprinklers. Assembling comprehensive and more accurate annual budgets for N2O emissions (and CH4) using event related modeling exercises developed in 2), and by frequent monitoring of emissions of N2O over time (season).